The Tennessee Titans can lay claim to being one of the most disrespected teams by Las Vegas oddsmakers. Even through a 10-0 start to the regular season last year the Titans never saw respect in terms of higher point spreads and the Titans responded by covering nine of their first 10 games. The lack of respect this year comes in the form of 20-1 Super Bowl Odds and an NFL season win total of nine games by the oddsmakers. All that despite 20 returning starters from a team that finished the regular season 13-3 and went 12-3-1 against the spread. Last year the disrespect may not have been warranted -- the Titans were favored by an average of 4.5 points per game despite plowing over the competition for the most part. This year the high Super Bowl Odds, the low season win total and losing the tag of AFC North favorite to the Indianapolis Colts may be dead on. Many aspects of the Titans game were exposed in a one and done playoff appearance against the Baltimore Ravens. Kerry Collins numbers last season (58.4 completion percentage, 12 TDs, 7 INTs) were not exactly championship caliber and signing Nate Washington from the Super Bowl champion Steelers is not going to help the cause. Name me the last time the Steelers deemed a free agent expendable and that player came back to produce? Rod Woodson and Joey Porter (at least in his second season) come to mind but Washington does not rank up there with those players. Washington was fifth in receptions for the Steelers last year. The Titans passing game will continue to struggle and despite stellar play from tailback duo Chris Johnson and LenDale White, who both seemed poised for another strong season, the one-dimensional attack cannot be sustained for an entire season. The Titans leading pass catcher from a year ago was Bo Scaife. After that it was running back Chris Johnson and after that it was Brandon Jones, who is no longer with the team. Look for no help from the draft either as first round pick Kenny Britt from Rutgers appears to be a project. The passing game will continue to be a glaring hole for Tennessee. Defensively Albert Haynesworth will not only be missed for his direct play on the field but also his defensive line mates were used to all eyes being on Albert and all double teams being on him, and they will miss the freedom he provided. His 8.5 sacks were by far the most on the team. Titan fans will hope the strong secondary anchored by all-pros Cortland Finnegan and Michael Griffin along with a linebacker trio of Keith Bulluck, David Thornton and Stephen Tulloch can help carry a Titans defense ranked seventh in the league last season. The defense will somehow have to find a way to improve on their play that limited opponents to less than 300 yards of offense a season to contend for another playoff spot. 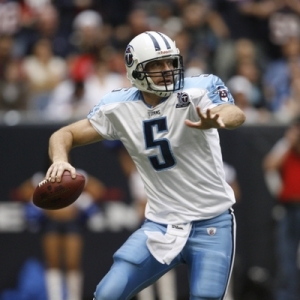 2009-10 Tennessee Titans Predictions: Even with the glaring deficiencies in the passing game and on the defensive line the over/under for wins at nine is not exactly a gaudy number to reach, especially when a schedule is dotted with games against NFC West opponents. Las Vegas may have been wrong in the regular season last year when undervaluing the Titans but they were right in the playoffs when it counted and projecting a four-game slide this year from 13-3 to 9-7, they appear to be on the right track. The football prediction here is under nine wins for the Titans.